Do you identify with this photo? Many of us do. 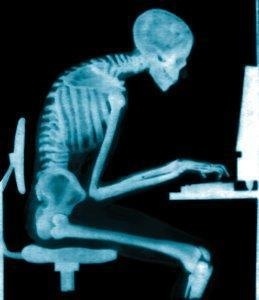 Many of us use computer stations or laptops that are not positioned well for us to maintain healthy posture. Andy, Leena and I have become aware of the effects of non-ergonomic computer use while we’re working away at the studio, and we’ve been experimenting with different ways of elevating our screens, keyboards and mice so that we can work in a more optimal position for our spines. Check out the various desk arrangements we’ve experimented with. We are lucky to have lots of yoga blocks around to play with! 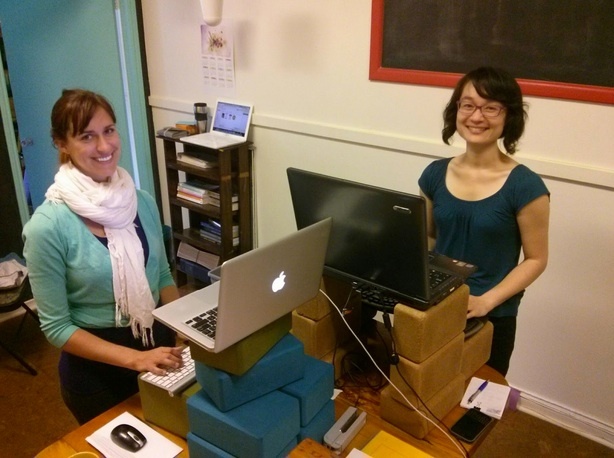 Over the course of the day, we alternate between standing and sitting desk arrangements. (Read more about the benefits of standing desks in this article). We also try to take regular stretch breaks (which sometimes turn into dance breaks in the front studio) to move our bodies and rest our eyes. Here is a standing desk arrangement that Andy has been using. The yoga mat under her feet makes it easier to stand for longer – it can be hard on one’s feet and legs to stand on a hard surface for a long time. Her keyboard and mouse are at a position just slightly lower than her elbows when she is standing, and her computer screen is right at eye level, so she doesn’t strain her neck by looking down. Andy has created a wrist rest using a folded up eye pillow (another yoga prop). There are differing opinions about whether using a wrist rest is optimal for your wrist. Check out this Healthy Typing website to learn more. Andy mentioned that since she’s begun using this desk set-up she experiences fewer headaches, which usually were a result of upper back and neck strain. We have a desktop computer at the studio, and when the monitor sits on the desk, the angle is a bit low and requires the user to look down. When Leena is working for longer periods at this computer, she puts a few yoga blocks underneath the monitor so she can look more forward than down. It’s important to be aware how you are sitting. Leena likes to sit on this Evolution Chair, because it encourages proper pelvic positioning and makes her sit up tall. This is one of the arrangements I use when I work from home. This is my coffee table in my living room! I sit on the floor on a meditation cushion, and have the mouse on my knee. My keyboard is at a comfortable height for my wrists, and my yoga blocks lift my screen up to eye level. If you’d like to figure out how to transform your home/work computer station into a more ergonomic arrangement, check out this article: 5-Step Approach to Setting Up an Ergonomic Work Station. It walks you through finding a good sitting posture, adjusting your screen, keyboard, mouse and chair. 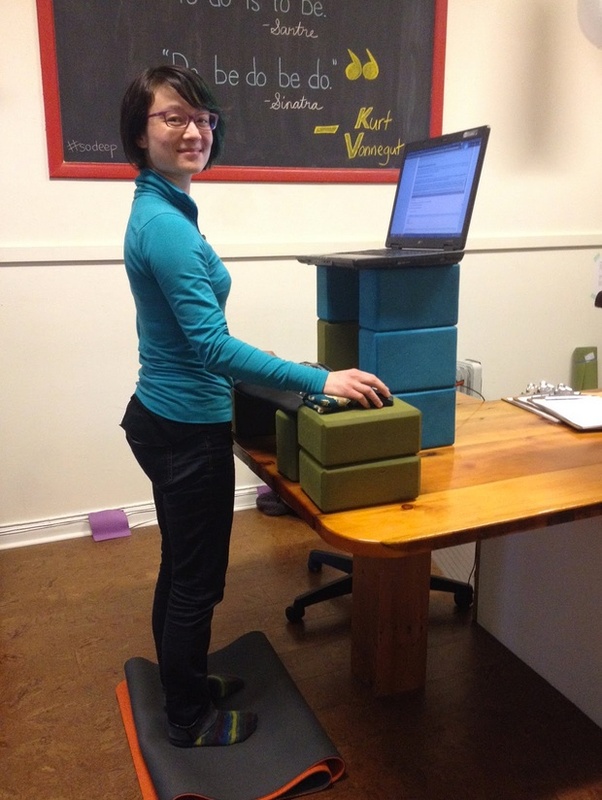 You can apply all those same principles to a standing desk (everything will just be elevated a lot higher). 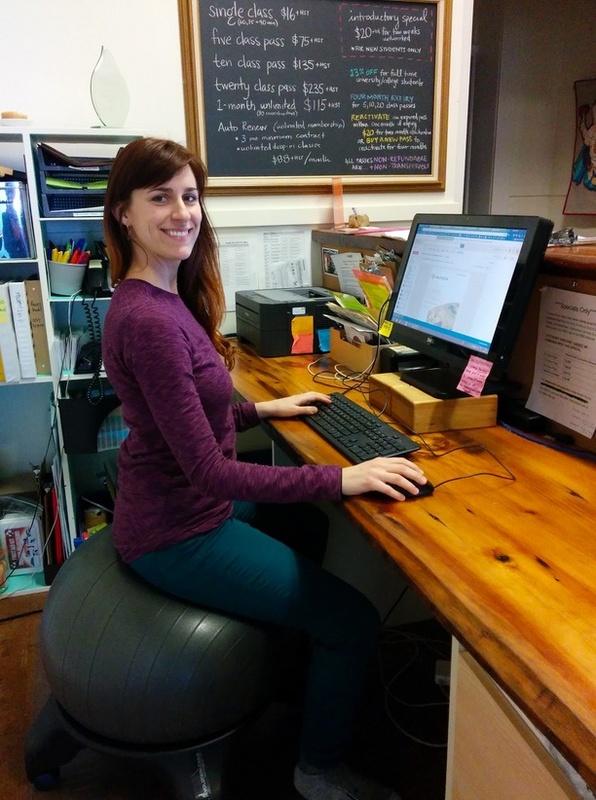 Emma Dines is the manager of Queen Street Yoga. She loves writing, visiting thrift stores and going for walks in the woods. 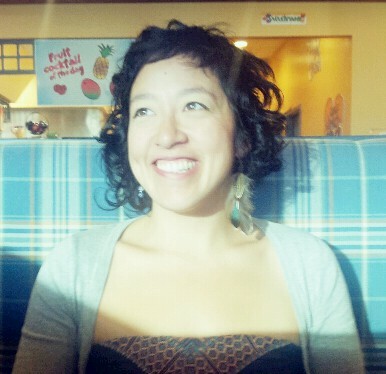 She also loves cartwheeling, sewing and making her own kimchi.